It all began in 2015. After seeing Star Wars: The Force Awakens, we started messaging each other furiously. For nearly two weeks there was non-stop chatter - on theories, ideas, things to look for, things we noticed, fleeting thoughts, any- and everything related to the movie. Two years went by, and after many many more text message debates like this, Mike and I decided to launch a podcast so we could just talk directly about everything. So in December of 2017, with the release of Star Wars: The Last Jedi, we launched The First Word Podcast - in-depth discussion, analysis, and interviews about the latest movies, and some old ones, too. We just released our 10th episode this week, so it's time for a recap of all the episodes so far. You know, in case you might've missed one. Or maybe you've never listened? There's no better time to start than now. To celebrate the occasion and for this look back at the 10 episodes we've made, I recruited graphic designer Eileen Steinbach to create a fun "album cover" for the podcast. It's a riff on cover for Queen's "Hot Space" (see here) and includes our dogs' faces (Nolan & Kenzie) in addition to our own. Why? Because we love our dogs! And they've been around while recording a few episodes, so it works. The full cover art can be seen below the list. More than anything, we want this podcast to reflect our passion for intellectual and inspiring conversations about movies. We want listeners to be encouraged to have their own discussions, to dig deep into cinema, to analyze the good and the bad, and to let the best movies encourage you to grow into a better person. We're happy to share our geek out sessions with you. So dust off your turntable, and spin our album. Episode #1 - Star Wars: The Last Jedi with guest: filmmaker Kyle Newman. This was our very first launch episode, and we spent 95 minutes geeking out over Rian Johnson's The Last Jedi, discussing what we liked, didn't like, all kinds of crazy theories, ideas, and so much more. 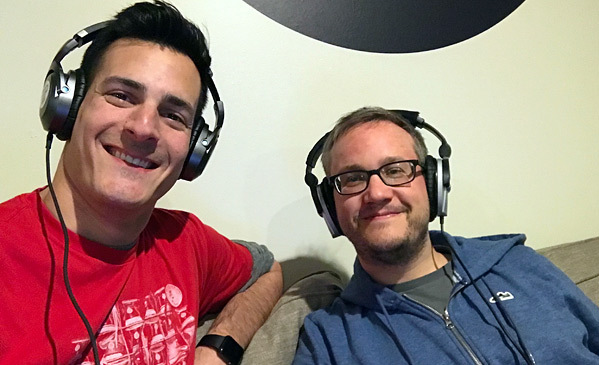 We wanted to set a precedent for full-on, intelligent discussion with this episode, getting right into everything that fascinates us about movies. > Direct iTunes episode link - listen here. Episode #2 - Top 10 Movies of 2017 with guest: cinephile Alicia Malone. Our second episode became a countdown of our Top 10 favorite films from 2017, because the timing was perfect. This gave us a chance to discuss the kinds of films we love and why we love them, providing listeners with a way to get to know our taste and preferences. We also wanted another perspective and brought on Alicia to discuss her favorites as well - she's one of my good friends and a die-hard movie geek and I love hearing from her. Episode #3 - "Black Mirror" + Sundance 2018 Recap with guest: filmmaker/writer Eric Heisserer. Since we're both sci-fi nerds, Mike requested an episode to discuss the latest season of the cult sci-fi show "Black Mirror" - since it's so damn good. Mike has been a long-time fan, but only recently convinced me to start watching and I quickly became a fan, too. Heisserer is also a sci-fi guy and he was the perfect person to bring on for this discussion. In addition to "Black Mirror", I wanted to provide a quick recap of a few of my favorite films from the Sundance Film Festival since the festival had wrapped up a week before we recorded. Episode #4 - Black Panther + MCU Recap with guest: film journalist Amon Warmann. Our first big Marvel discussion, this time with one of my movie geek friends from London. Amon was very excited to talk about his obsession with Black Panther, and although we all loved the movie, there were a couple of issues with it that we discussed in the episode. At the end we also talked about our thoughts on the current state of the Marvel Cinematic Universe and some of our favorite Marvel movies from the past. Episode #5 - Alex Garland's Annihilation with no guest this time, because this was a surprise episode. We recorded this one right away when Mike flipped and texted me saying "we NEED to have a discussion about Annihilation!!" There's so much to analyze and discuss about this film, and he wanted to get into as soon as possible. We're sci-fi nerds, what can we say? And this is one of the best sci-fi films of the year. Episode #6 - The 2018 Academy Awards with guest: Oscar blogger / journalist Sasha Stone. One of our longest episodes (at 111 minutes), but also our most comprehensive and fascinating episode. Right after the Academy Awards just the night before, we brought on the one-and-only Sasha Stone for a breakdown about the Oscars: the winners, the losers, the whole shebang. It's one of the best discussions we've had so far, thanks in large part to the brilliance of Sasha and all of her extensive knowledge/experience in the film world. This is one you have to listen to if you're fascinated by the film industry and how it all works. Episode #7 - Video Game Movies with guest: filmmaker Jordan Vogt-Roberts. With the release of Tomb Raider, we wanted to have a discussion about video game movies. And why they're always bad. But will that ever change? So we brought on a major video game fan who's also a talented filmmaker to discuss the challenges of making a good video game movie. One of the most interesting episodes we've recorded. Episode #8 - Wes Anderson's Isle of Dogs + Dog Movies with guest: film journalist Tomris Laffly. We love dogs! Mike and I are both massive dog lovers (hence the dog album cover), and we decided it was finally the right time to record an episode about dogs and dog movies. We brought on Tomris Laffly, another dog lover, and started with a discussion about Wes Anderson's pro-dog movie Isle of Dogs, then continued with an extra fun discussion about all the dog movies out there - the good ones, the bad ones, the sad ones, the happy ones. Find a dog to cuddle with when listening to this very fun episode. Episode #9 - Avengers: Infinity War with two guests: film journalist Alisha Grauso & film journalist Amon Warmann. An epic podcast episode for an epic movie! To stick with the theme of bringing everyone into one big movie, we decided to bring on two esteemed guests for this special Avengers discussion. And what fun we had. We geeked out for over two hours about Marvel's ginormous superhero spectacle, discussing what worked and what didn't, and what hopes we have for the future of the MCU after this. Episode #10 - Solo: A Star Wars Story with guest: film journalist Germain Lussier. We've come full circle with another Star Wars episode, discussing the latest from Lucasfilm. While many moviegoers seem to be upset by Solo, all of us enjoyed it. Half of our discussion is trying to figure out why so many hated it, and the other half is discussing what we liked about it, and why this movie may be better than most think. Those are all the episodes of The First Word Podcast so far! We'll continue to record new episodes every 2 - 3 weeks, depending on our schedules and guest availability. Mike and I are both very busy and it's usually hard to find time when we're both free, and then it's even harder to find a time that works for the guest as well. But we're determined to keep at it, discussing a wide range of topics with some of our favorite people from the film world (and beyond). Whether they're filmmakers, actors, screenwriters, journalists, bloggers, critics, or whoever, there's so many distinct and wonderful voices out there and it's our mission to include them in our conversations. We hope you're enjoying the podcast and our movie discussions, and please get in touch if you have any honest feedback or interesting thoughts or comments about anything. Ciao for now. 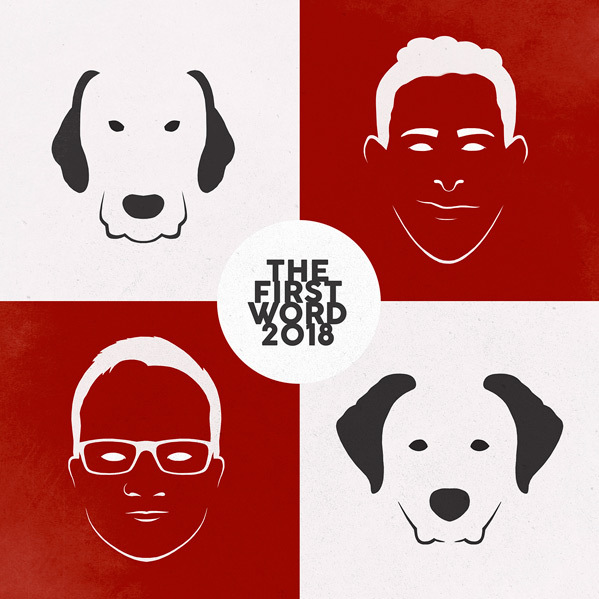 If you'd like to listen to our next episodes, please subscribe to The First Word podcast on iTunes here. The logo for The First Word (and our awesome album cover seen above) was designed by the very talented Eileen Steinbach - follow her @SG_Posters and see more of her work on her website here. She is the best.